Few things are as scary to many people as the prospect of being audited on their tax returns. The tax man is like the grown up version of the boogeyman. It would be easy to say that you don’t have anything to fear if you haven’t done anything wrong, but the reality is that many people make simple mistakes without any dubious intent. Also, the IRS is not infallible, and just because it flags a return doesn’t mean that the taxpayer has committed any wrongdoing. In many cases, working with a Phoenix lawyer for tax audit can help you clear up the issue or minimize the risk of any penalties you face for actual errors. It may come as a sigh of relief to many to know that the prospect of an IRS audit is a bit lower these days, which means that many won’t have to hire a lawyer to fight the good fight. Last year, a lot of taxpayers reported that they had a hard time getting an agent on the line when they called in with questions or concerns. It was the result of cost-cutting that meant fewer agents available to field calls. But that wasn’t all: The IRS was also auditing fewer tax payers last year because it didn’t have the manpower to handle it. In fact, it audited 22 percent fewer returns last year than it did five years earlier. Money talks, and its absence is speaking volumes with the IRS right now. Its funding was down $900 million this year compared to 2010, and that has had a big impact on what it can do. The tax agency audited 1.2 million taxpayers in 2010, which was 1.1 percent of individuals. However, it only audited 350,000 taxpayers in 2015, which was 0.8 percent of taxpayers. Not only was that a significant drop from five years earlier, but it was the lowest amount in the last 10 years. The budget cuts are expected to continue, so your odds of being audited are expected to remain lower. Many will breathe a sigh of relief knowing that their chances of having to deal with the tax man have gone down. Other taxpayers aren’t going to be so happy about this news because it means that some people who are legitimately cheating the system are likely getting away with it. Since the IRS doesn’t have the staff to conduct as many audits, more people are slipping through the cracks. The budget cuts are also costing the agency even more money. Since the IRS is not able to conduct as many audits, it has recovered about $30 billion less over the last five years than it did the five years before that. The IRS estimates that for every $1 it puts into enforcement, it recovers about $4 in revenue. Congress should rethink the whole IRS budget. With a 4:1 payback, it seems only logical that Congress should increase, not decrease, funding. An IRS official has also publicly said that the agency is not able to collect about $6 billion a year that it is owed — which extends beyond just what enforcement efforts get from audits. Some may think that the current situation creates a free for all for those who don’t want to pay their taxes, but failing to file a return or filing a false return is like playing Russian roulette. You might slip through the cracks unnoticed, but you also might be one of the few to be flagged and audited. When the IRS gets its budget back on track, it can also look back through previous years. If you are audited, the IRS can then look at your previous returns and audit them, as well. You may not be audited this year, but you could be audited for this year’s return in several years from now. 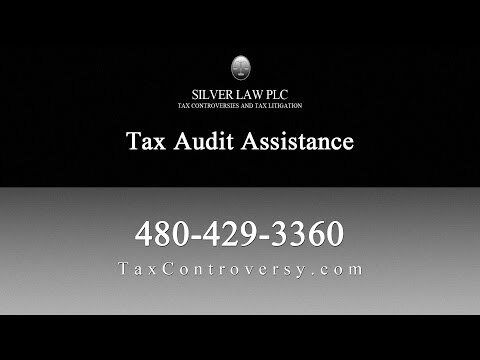 The Scottsdale tax attorneys at Silver Law PLC provide representation for tax audits, tax litigation, collections, and other tax matters. Our dedicated team will work to clear or reduce the charges against you so that you can avoid or minimize penalties. Sometimes, clearing up an audit is as simple as providing the right documentation or showing evidence for why you qualify for certain credits or deductions. Your lawyer will thoroughly review the details of your case to find all the possible ways to defend your case. Call us in Arizona today to talk with a lawyer for tax audit and to learn your legal rights.